You guys, the Spring Equinox is upon us and that means that summer is cominggggg!!! Ok, where I’m living in Mexico, that actually means that the weather is about to take a turn for the worst, but I think most of you reading this are pumped for summer so I’m pumped for you! The Spring Equinox marks the transition from winter to spring, which has always been very exciting for me because I hate winter (hence why I live in Mexico now). This year (2018), the Spring Equinox falls on March 20th. If you want to read more about what an Equinox is, you can find a blurb on that in this post about the Autumn Equinox. 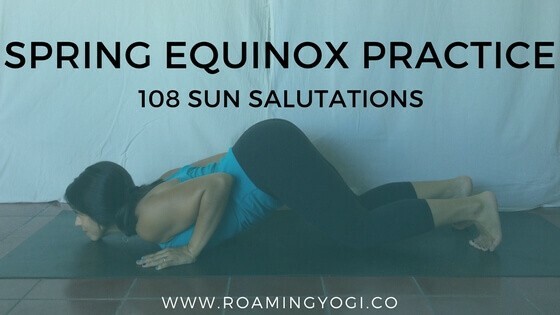 This post will be all about the Spring Equinox and a popular Spring Equinox ritual: 108 sun salutations ! At the Spring and Autumn Equinoxes, day and night are of equal length: 12 hours each. As the Earth passes through the balanced equinox point at the end of winter (the Spring Equinox), its axis begins to lean towards from the sun. This brings the southern hemisphere further away from, and the northern hemisphere closer to, the sun. As a result, the sun’s rays hit the northern hemisphere more directly, and we get more sunshine in this part of the world. This increasing sunlight creates a palpable shift, as winter begins to wane, and the top half of our planet moves back into the heat of the sun. The Spring Equinox is the point at which we are about to turn toward the brightest time of the year, as the days start to stretch longer. Trees and plants begin new cycles of growth. Butterflies and birds emerge. People leave their scarves and winter coats at home and flock to their nearest park at the first sign of temps above 50 degrees (Fahrenheit — I don’t know how that shakes out in Celsius). It’s a glorious time of year; it was one of my favorites when I lived in NYC. The beginning of spring can spark a desire for renewal and new beginnings (spring cleaning, anyone?). 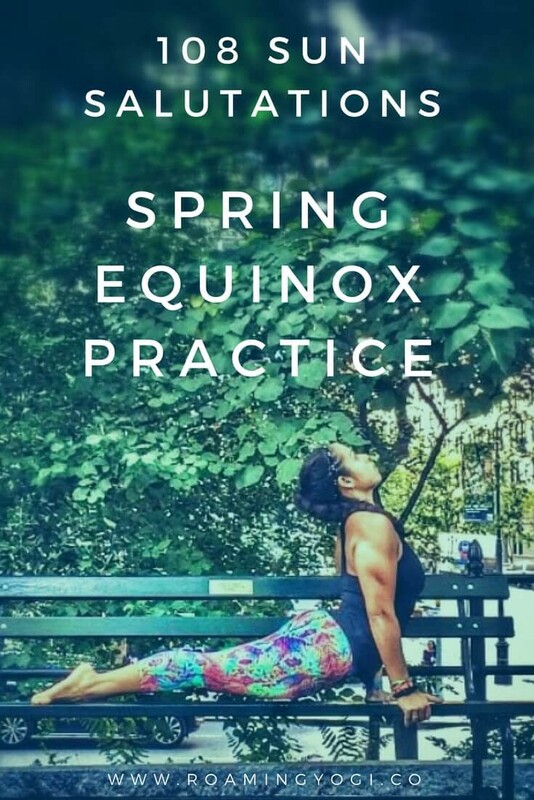 A great way to greet spring is with some rituals to welcome change, growth, revitalization, and renewal. One such ritual is performing 108 sun salutations. You might have heard of this ritual before; it’s a popular practice during seasonal shifts (autumn & spring equinoxes, winter & summer solstices), as well as to bring in the new year. There are 54 letters in the Sanskrit alphabet, and each letter has a masculine and feminine: Shiva and Shakti. 54 x 2 = 108. The chakras (energy centers within the body that start at the root and travel up through the crown of the head) are the intersections of energy lines (nadis). There are said to be a total of 108 energy lines converging to form the heart chakra. 9 and 12 are said to have spiritual significance in many traditions. 9 x 12 = 108. Some say there are 108 feelings: 36 related to the past, 36 related to the present, and 36 related to the future. In addition to the number, the ritual of sun salutations has an auspicious meaning for many yogis. Sun Salutations are an ancient sequence of movements intended to express gratitude to the sun. The Sanskrit for Sun Salutation is Surya Namaskar — Surya meaning “sun” and Namaskar meaning “to bow.” In the action of sun salutations, we reach our arms toward the sun and then bow forward toward the earth. There is meaning in this movement. The sun literally gives life to all things on earth. It may be the closest thing to ‘god’ that we can tangibly see. I invite you to think about the life-giving power of the sun as we move through our 108 Surya Namaskars in this practice. Sun Salutations are the classic yoga warm-up sequences, linking flowing movement to deep breathing. They stretch the entire front and back of the body, and they build strength. They’re great for warming up for any class, and they consist of many foundational postures. The movement through 108 sun salutations, whichever variation you prefer, takes on a meditative quality as you flow through the same movements again and again.